In November 2013, a five-year-old boy named Miles Scott won our hearts when the Make-A-Wish Foundation transformed him into Batkid for a day. The new documentary Batkid Begins takes us behind the scenes of that day and shows us how one kid’s wish became a massive phenomenon. Miles Scott wanted to be Batman. If you followed the hoopla over Batkid Day, chances are you know the basic story: Miles was diagnosed with lymphoblastic leukemia when he was just 18 months old and spent a good amount of his early life enduring chemotherapy treatment. The Make-A-Wish Foundation arranged for Miles to be Batman — or rather Batkid — for a day. 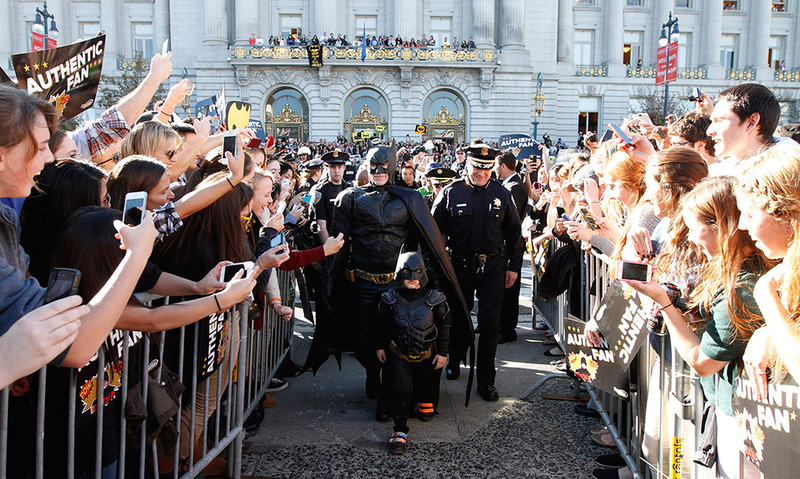 The story went viral, and when Batkid Day arrived, thousands of people gathered in San Francisco to cheer Miles on. He received well wishes from Batman actors and even President Obama. It ended up being one of the most elaborate wishes the foundation had ever granted. Even if you happened to be in San Francisco that day, Dana Nachman’s documentary offers an inside look at Batkid Day that you couldn’t have gotten from the streets. We meet Patricia Wilson, Executive Director of Make-A-Wish Greater Bay Area, Eric Johnston, who volunteered to play Batman to Miles’ Batkid (and invented some neat Bat-gadgets along the way), and Mike Jutan, who played the Penguin and is credited with making the event go viral. And we see just how much work and enthusiasm they put into making Miles’ wish something special. But, not surprisingly, Batkid Begins really shines when it turns the spotlight on Miles. There can be uncomfortable moments in the film where I found myself wondering: Does Miles really want all this? Where is the line between making this child the recipient of a precious gift and a performer for all those waiting people on the streets of San Francisco? Those fears melted away when Miles first donned the Batkid suit and, in one of the funniest, most uplifting sequences of the film, becomes an entirely different person. That’s when we truly understand what a powerful fantasy being Batman is for this normally shy, quiet child. For so many of the participants and spectators, Batkid Day is a momentary return to childhood. For Miles, it’s much more. In a few places, though, it does feel like Batkid Begins misses its own point. It wants to be a movie about how millions of people wanted to share in one little boy’s joy, but occasionally it forgets the joy in favor of the popularity. It’s one thing to watch San Francisco Police Chief Greg Suhr choking back tears as he recalls how the city came together in a day of genuine fraternity. It’s another to watch a Twitter employee freaking out over the celebrities responding to his Batkid tweets. On the whole, though, Batkid Begins is a genuinely feel-good movie, one about a day where cynicism and selfishness gave way to excitement and wonder. If you found yourself wishing that you could have ridden along with Miles that day, Batkid Begins is the next best thing. And as you’re watching people dancing in the streets and flashing “Save us, Batkid!” signs, you might feel a twinge of regret that you weren’t there too.